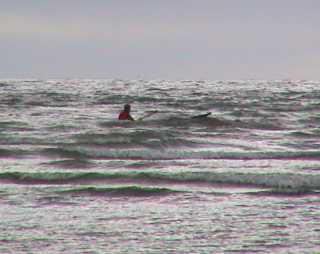 In calm weather, waves are nearly always fun for experienced kayakers. On most coasts, waves and wind go together. 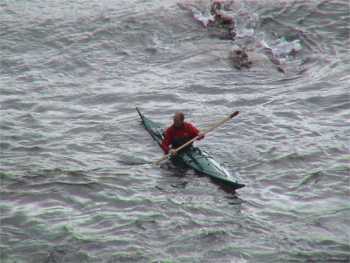 Most sea kayakers stay ashore when there are strong winds. On the lee side of an ocean it is always possible to experience very large waves breaking on the beach and cliffs with no wind at all, especially in California where the winds of mid-ocean low pressure systems create a big swell but the low itself is deflected north by the Pacific high. When we talk about waves and the sea, usually we're thinking about surf waves. You may also encounter waves like the "standing waves" or "playwaves" you find on a river. Click here for more about waves and fast-moving water. ... and when to stay in deeper water to avoid being soaked, capsized or surfed into a rock. Nearly all waves are created by wind blowing over water, and they travel in about the same direction as the wind which created them. The wind needs both time and distance to create large waves. The area over which it blows while doing so is technically known as the fetch. Local winds. After a day of Force 5 winds there will be quite large waves downwind of any open water more than a mile wide. 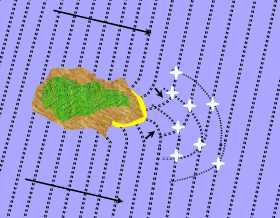 Waves directly created by local winds are steep and a short distance apart (short wavelength). If the wind changes they soon fade out and cancel each other out. If you are in a fast sea kayak and you want to travel in the same direction as wind-generated waves, you can make your trip more fun and possibly faster. Wait until the back of your kayak sinks down and it feels as if you are paddling in molasses. Take a few hard forward paddle strokes to accelerate and you will be surfing on the next wave. See Surfing A Sea Kayak. Swell was created by mid-ocean winds blowing consistently in the same direction for a long period. Even a fast sea kayak is seldom able to catch and surf swell out at sea. Its slope is too shallow and it travels too fast, often at over 20 knots. It has a very long wavelength which enables it to travel hundreds of miles outside the fetch. Out at sea there is usually some swell. Swell is defined by the IHO Hydrographic Dictionary as "ocean waves which have travelled out of their generating area. Swell characteristically exhibits a more regular and longer period and has flatter crests than waves within their fetch". It consists of parallel lines of waves, all travelling in the same direction and seldom more than 6 feet high in sea kayaking waters, but with a distance between crests (the wavelength) that may be 100 feet or more. A really big swell may not be very high but its wavelength of hundreds of feet will give you a hint of vertigo and a proper feeling of your own insignificance as each wave passes beneath you. Swell consists of energy moving though the water. As each green wave goes past you, the surface of the water goes up and down but the water itself does not go anywhere. Swell on its own is no problem at all for sea kayakers. In calm conditions it does not create any foam or turbulence on the surface. Unless it encounters a strong wind or current going the other way, it does not steepen and break in deep water. When swell reaches shallow water it will create breaking waves. The longer the wavelength, the faster it travels and the more it will rear up on entering shallow water. However you will still be able to find sheltered water without waves in a harbour, an estuary or under the lee of a headland. Groundswell. To some experts this is just another word for swell, to others it means swell that is starting to touch the bottom. According to the IHO Hydrographic Dictionary it is "a long high ocean swell; also, this swell as it rises to prominent height in shallow water". Either way, the waves are not breaking. Breakers. When a wave enters shallow water, slows down and starts to break, it turns from moving energy into moving water as tons of water cascade towards the beach. 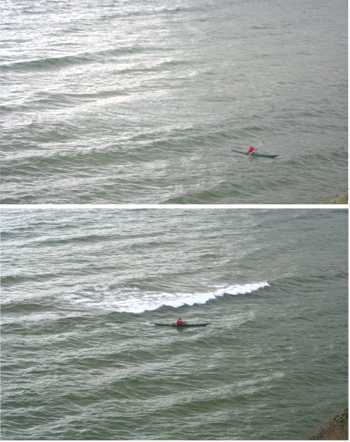 The way a wave breaks on a beach is of direct interest to kayakers. See The Nature Of Surf - Spilling Or Plunging. When might you encounter a breaking wave someplace other than next to the shore? In windy conditions the crest of a wave may break even in deep water, spilling forwards but with no great force. Waves with breaking crests (whitecaps or white horses) are common at sea in winds of Force 4 and above. Usually you can easily deal with them with a quick low brace support stroke. In worryingly windy conditions, Force 5 or above, you may occasionally be hit by the spilling crest of a wave 3 feet high. This may look intimidating but it is still only the crest which is breaking. It has little force and you can easily cope with it using a high brace. If waves are much higher than that, you may capsize unless you are an experienced kayak surfer. Hold your breath and wait a few seconds until things are calmer, then roll up. Sea kayakers don't generally venture out in conditions that windy. It is difficult to tell, looking down at the open sea from a cliff top, whether there is a big swell running. If you go and stand by the water's edge at a nearby surf beach you will get a better idea of the size of the swell. Boomers. If there is a big swell running, or there are big 40-knot ferries operating in the area, to avoid unpleasant surprises you should stay clear of isolated shallow areas in the sea. That means reefs, offshore banks of sand or mud, and the sand-bars which often exist at the mouth of a river. A reef or sand-bar 3 feet below the surface is likely to make every swell peak up and break. If it is six feet below the surface, only larger waves will break. On a coast which is exposed to ocean swell there may be the occasional big, isolated breaking wave (boomer) over a reef covered by 10 or 12 feet of water. Most waves will just roll smoothly over it but extra-large waves may break there once every 30 or 40 minutes. However engrossed you are with the person in the next kayak, your GPS or those strange birds on the cliff, always keep an eye on the next mile of your course in case of a flash of white. On unfamiliar parts of exposed coasts, check the chart for shallow areas and stay clear. Your editor broke that rule early in his sea kayaking career and was lucky to get away with it. See How Not To Do It. Some coastal weather forecasts give a one-word or one-digit description of the sea state. 1 meter is 3 ft 4 in. • Slight means 0.5 to 1.25 meters high. • Moderate means 1.25 to 2.5 meters high. • Rough means 2.5 to 4 meters high. • High is 6 -9 meters, very high 9-14 meters, phenomenal is more than 14 meters. In the World Meteorological Organisation sea state code, 4 is moderate and 5 is rough. If the wind blows in the opposite direction to a current it will create steep waves, close together, known as "wind against tide" or "wind over tide" conditions. Generally the waves are small and just give you the choice whether to paddle with the tide or against it. If you choose to go up-tide each wave will push you on your way a little and you may be able to surf on some of them. A current of 1.5 or 2 knots opposed by a Force 3 wind may create a noticeable chop, with steep waves close together, which will be worrying for the beginner but fun for everybody else. Wind over tide conditions are seldom a problem, even in parts of the world with a very large tidal range and therefore strong tidal streams. Wind over tide conditions are significant where local currents are strong. They can come as a real surprise where there are reversing currents, as in a narrow channel or estuary where the current quickly makes a 180 degree change of direction every six hours. When the tide turns and suddenly opposes the wind and waves, things can get rough and cause real problems for inexperienced kayakers. When waves encounter a current flowing in the opposite direction they get steeper, taller and closer together. This is very similar to what happens when a wave encounters shallow water. Charts and pilot books warn of a few places where large waves regularly march in from the ocean and meet unusually powerful currents going the other way. Currents seldom run faster than 2 or 3 knots. Anyplace where they run at 7 knots or more is worth treating with care. 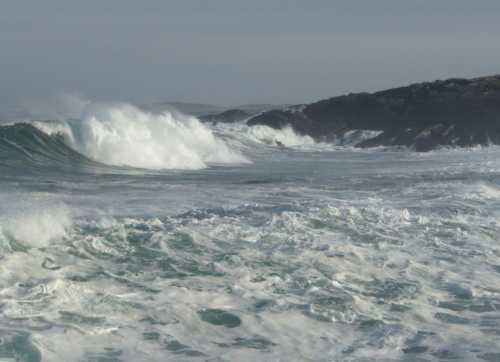 Sumburgh Head in the Shetland Islands is an extreme example where a heavy swell meeting very fast currents creates a clearly-defined area of rough sea in winds coming from any direction except the north east. At maximum flow on spring tides, the pilot book says there is a "confused, tumbling and bursting sea" in which "vessels often become entirely unmanageable and sometimes founder". In France, the Gulf of Morbihan is a large area of water with only a small opening to the sea, and a large tidal range. Tidal streams in the entrance to the Gulf often reach 9 knots. This is very, very fast. That sort of speed is normally associated with dangerous conditions like those we describe here. Powerful swirling eddies in the entrance can be disconcerting and occasionally send a yacht in a 360 degree turn. However local kayakers tell us there is nothing dangerous about the Gulf unless the outgoing tide is opposed by a swell coming in from the south-east / south-west. That combination can create a raz in the entrance. A wave which hits a rough surface like a reef or cliff loses most of its energy on impact, in a cloud of spray. A wave which hits a smooth vertical surface such as a harbor wall often bounces off without losing much energy. The lines of incoming waves and outgoing reflected waves make a pattern called clapotis. Where two wave lines intersect, the wave height nearly doubles and the adjoining trough is deeper than usual. Intersecting waves often break in a sharp peak. If you are sitting there when one rises up underneath you, you may be lifted 3 or 6 feet skywards with a feeling like being kicked upstairs. White stars in the diagram. Clapotis seldom extends more than 30 yards out to sea. A very few parts of the world are notorious for steep intersecting waves that make an entire mile-wide channel a bit of a challenge even for commercial ferries. As well as being reflected, waves can be refracted or diffracted into a curve. After a wave goes through a narrow harbor entrance it spreads out across the entire harbor but with reduced height, slower speed and greater distance between waves. This is diffraction. Diffraction and refraction are the reasons why why waves breaking on a beach usually approach parallel to the water's edge, no matter where the ocean swell is coming from. 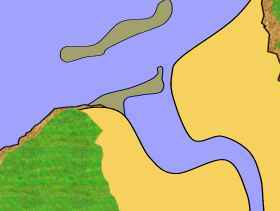 In the top right corner of the diagram, the swell out at sea is travelling along the line of a gentle sandy beach. When it goes past the headland, the inshore end of each wave is diffracted towards the beach. On entering shallow water near the beach, it drags along the bottom and slows down, turning even more towards the beach. This is refraction. These effects create a wave shadow, shown in darker blue on the diagram. 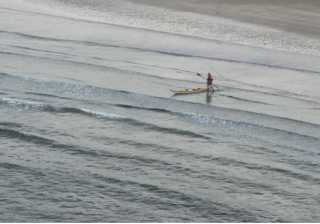 A sea kayaker can take that route to avoid big surf on the rest of the beach. 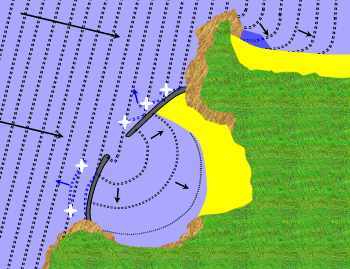 Wave energy may also be focused by a funnel-shaped gully or cave. After entering the wide end of a gully, a wave will get higher as the gully gets narrower. If it breaks in the narrowest part, it will do so with concentrated power. This quite often surfs a kayaker into a rock, occasionally loops a sea kayak in a gully 8 feet wide (your editor has a vivid memory of that happening to him!) and may suddenly fill a cave until there's not much headroom. See photo. A really big swell coming from the open ocean can unexpectedly fill a big cave to the ceiling. In a few places along the coast you may encounter waves created by large vessels moving at high speed inshore. Superferries and warships are very heavy and may travel at 40 knots so they create an amazingly powerful wake. You won't often notice it in deep water but when it reaches land it can break 9 feet high on a reef, fill caves to the roof and wash rock climbers off sea cliffs. The Holyhead to Ireland ferry goes past one of Britain's most popular venues for sea kayaking and rock climbing and there have been complaints about excessive speed. We also recall hearing about a ferry operating out of, we think, Lowestoft that sent a 9 foot wall of water up the beach and smashed the windows of a seafront cafe. Surf kayakers want surf, touring sea kayakers would rather avoid it. When waves encounter a current flowing in the opposite they get steeper, taller and closer together, so it is possible for there to be scary breaking waves right in the main channel. If so you can go up the side in shallower water. Many river estuaries and deep bays have a bar (a reef of sand) across the mouth. Usually there is a deep-water channel which is safe but a boat taking a short cut over the bar may meet a very large breaking wave. On the Oregon coast there are bars at the mouths of a great many rivers, and they are hazardous when a strong ebb current in the river meets large waves coming in from the ocean. When necessary the Coast Guard gives danger warnings on local radio, on VHF Channel 16 and with Rough Bar signs and flashing amber lights at boat ramps and in harbors. The chart extract we use as an example of features on a chart has a written warning that when there is an onshore wind, large waves may break on the sandbars at the mouths of two small natural harbors. "No attempt should be made to enter Langstone Harbour during strong onshore winds as the seas break on Langstone Bar. 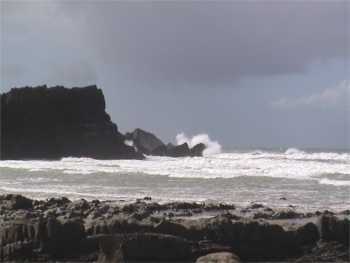 The breakers are particularly hazardous when a strong ebb tide is flowing" as it makes the waves even steeper. Many small rivers flow quietly through sandy estuaries and across a gentle sandy beach to enter the sea as in this photo. Very pretty and peaceful, but don't relax completely. At low tide, the last few yards of the river may descend quite steeply, speeding up and generating a series of steep stationary waves. One minute a group of novice kayakers is eating lunch and drifting down river in the sunshine, sprayskirts off, cameras out. The next minute it's carnage, with half of them in the water. In a few shallow estuaries with a large tidal range you may encounter a large incoming wave. See Tidal Bore Waves.